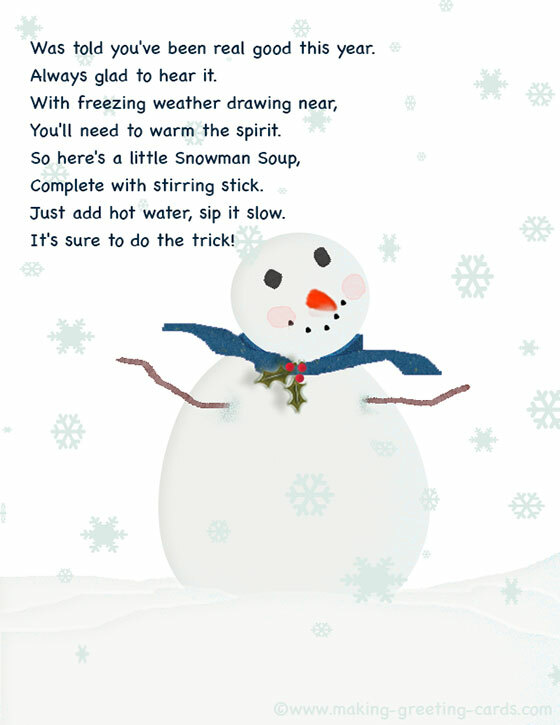 Christmas Gift 4 is a homemade recipe for snowman soup - a fun Christmas gift to put into your Christmas stocking. Gather the items named below, create labels or tags to go with them and give them away as Christmas gifts. They make good warm gifts for a cold wintry Christmas. Included are words for you to put on your labels or tags so you can copy and paste them onto a Word document and print them out and decorate with Snowman and snowflakes just like what I did in the image above. These are really easy and fun to put together with children and great gifts for them too. Instead of using rubber stamps, you can also insert snowman and snowflakes graphics or clip-arts into your Word document. Prefer to use a photo or graphic software like Photoshop Elements? For myself, I created the above image using Photoshop, an application from Adobe. Go ahead. Create the labels the best way you can and desire using the method you are most comfortable with. Copy the words above and paste into a Word document on your computer. Choose a desired font and font size to fit into your design. Leave space for the snowman image to be stamped in later. Print out the words on nice white or light colour card stock. Stamp snowman on the side of the card, label or tag. Colour in and add some snowflakes too.